Bluehost is a renowned web hosting company in the world. They have been doing this since 2003. Currently, they are believed to be one of the top 5 best web hosting providers in the entire world. They are well known for providing all kinds of web hosting services like shared, VPS, dedicated etc. But, the most popular web hosting solution from Bluehost is the shared hosting service. Hence, we will be talking about Bluehost shared hosting service in this article. Furthermore, we will be giving away some exclusive information regarding Bluehost. So, if you want to be part of it, you can begin reading this. We believe it will benefit you in making your decision whether you should consider using Bluehost as your next web host provider or not. Most probably, all of you already know about shared hosting very well. Yet, for our readers, we will try to explain it simply. After you have bought a web hosting account from any web hosting provider, you are actually renting a portion of a server to store your websites’ data on it. Now, those servers come in numerous sizes and shapes. But, in the case of shared hosting, a single server is generally distributed among multiple users. So, all of the users which are using a particular server will be utilizing the resources of that server together. In other words, you can say that web hosting providers are allocating a single server to host multiple websites of their customers in it. And, this concept is known as shared hosting. To be honest, shared hosting comes with both the pros and cons. The most noteworthy pros of a shared hosting is that they are inexpensive compared to other forms of hosting. Conversely, the worst thing about shared hosting is that you might not get the best performance out of your website/s due to the resource sharing among users. So, whenever one or more websites will receive a sudden spike on traffics, the performance of all the other websites on that particular server will be throttled. Also, you will receive less functionality and customizability on shared hosting compared to other hosting services. However, a good web hosting provider can reduce the cons to a great extent with the help of their quality service. So, we will be discussing how Bluehost does it in this post. Bluehost shared hosting plans were created in a way that it can be easy for users of all kinds to choose their suitable plan. 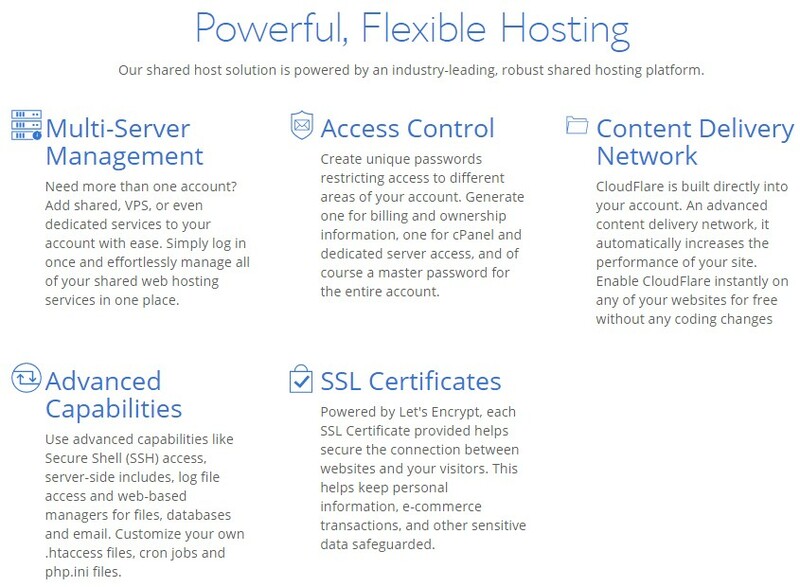 There are 4 shared hosting plans of Bluehost. They are Basic, Plus, Choice Plus, and Go Pro (Special) respectively. These 4 plans come with specific features and price range. So, depending on your requirements you will find your best fit. Let’s take a look into those plans in greater detail. As the name suggests, it is the most basic plan of them all. You can buy this plan with as low as 2.95$ per month. As this is the lowest priced plan, you will have to sacrifice some features if you want to use it. First off, you can’t host more than one websites using the ‘Basic Plan’, you can only host one website. You will have only 50 GB SSD Storage. You will have unmetered Bandwidth though. But, you can create only 5 custom email accounts and also will be allowed to create 25 subdomains and 5 parked domains only. And other special features won’t be available with this plan as well. So, if you want more flexibility, you have to skip this plan and look into the next ones. The ‘Plus’ Shared hosting plans of Bluehost can be a good choice for you. It will cost you at least 5.95$ per month. And for that, you are getting unmetered storage space, unmetered bandwidth. 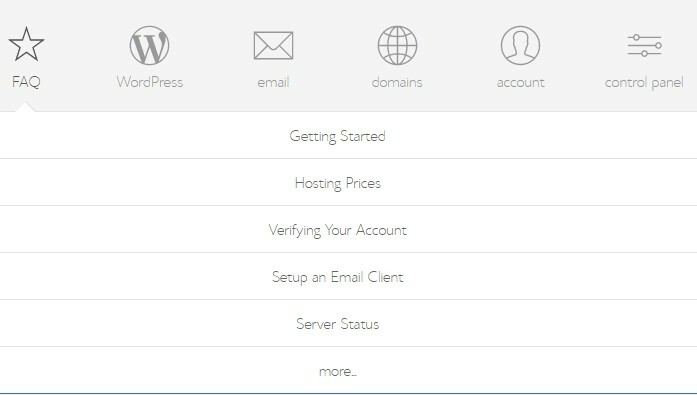 And, the best part is that you can host multiple websites on your account. But, we would not recommend you getting this plan. Because the price of this plan is similar to the next plan but that plan has some extra features. So, let’s see what the next one offers. If you‘d ask us for our suggestion on choosing the best plan but within an affordable budget then we would vote for the ‘Choice plus’ plan. Why? Because it costs the same 5.95$ each month like the previously mentioned plan. However, you are going to receive additional features for the same price. Even, Bluehost officially recommends this package to their customers. With this plan, you are also allowed to have unlimited websites, unmetered bandwidth, and unlimited storage space. Along with all these, you will be getting an additional domain privacy tool for one of your domain. You will also get CodeGuard Basic. With CodeGuard basic, you can take scheduled backup of your site automatically. These features are free with the ‘Choice Plus’ plan but can come in handy at any time. If you are looking for the best of the best. And, you are not worried about your budget then the ‘Go Pro’ is the best plan you can get. You will have to spend at least 13.95$/ monthly for this package. But, we can tell you that it will be worth it. The notable feature of this package is that you will be getting a high-performance server with your account. For shared hosting users, a high-performance server can be very beneficial. But, there’s more. With this plan, you will get all the features and services that come with the ‘Choice Plus’ package. Beside all these, you will also get ‘Dedicated IP’ for your websites for free. For your information, all of these mentioned prices here are after applying a specific amount of discount. The amount of the discount is related to the length of your billing cycle. And, from Bluehost, you have to buy any packages for at least 12 months. You will get the lowest amount of discount if you buy for only one year. Conversely, you can buy most of the plans for 3 to 5 years at once. And, that will translate into the highest discount. If you are going to try any plans, we would recommend to get it for at least 3 years. That way you will get the lowest price on all the pans. There you have it. All the shared hosting plans of Bluehost explained for you. Now, let’s proceed to the next section. Who should take the Bluehost Shared Hosting Plan? Shared hosting from Bluehost can be a suitable option for many people. For instance, if you’re a newbie on blogging then this should be your next web hosting company. All the shared hosting plans are created for people of different requirements. But, the most important aspect of those plans is that they are affordable and feature-rich. So, if you’re in a tight budget, any one of the Bluehost shared hosting plans would be suitable for you. Now, if you have a personal blog, small business website or an e-commerce website then you can start using Bluehost shared hosting. As in that case, it is probable that you are not receiving loads of traffic to your site. For professional webmasters, Bluehost shared hosting can be the ultimate choice. On the flip side, any novice users can take advantage of this platform. As Bluehost has made it very simple to use their shared hosting service. Most of the software that comes with this service is very user-friendly. So, even a person who had no experience with any other web hosting services will find Bluehost shared hosting service as a perfect solution. However, if you have multiple websites which are receiving huge amounts of visitors per month, you should refrain from using shared hosting package of Bluehost. Because shared hosting servers are not created for high traffic load. If you are not aware of that, you will not only hamper the performance of your website but also other users’ websites too. In a few words, if you are getting into the online journey or trying to find a web hosting solution within an affordable price range but with all the necessary features and specifications of a good quality web hosting provider then Bluehost shared hosting is for you. Is it suitable for all the web applications? As you are reading this post, you must have heard of WordPress, Joomla or Drupal. Am I right? They are some of the popular CMS (Content Management System) on the web. They are also known as web applications. Their job is to help you manage your website to create, add, delete, edit the contents of your site without any coding. Among all the CMSs it is known that WordPress is the most used one out there. Why? Because it is very user-friendly and has the biggest community. Thus, you may be eager to use WordPress on your own website. If that’s the case then you are in for a treat. Bluehost exclusively supports WordPress. All of their servers, in-house software, are particularly optimized for WordPress. So, if you want to use WordPress then you will enjoy a thrilling ride choosing Bluehost shared hosting service. Now, what if you don’t want to use WordPress on your site? No need to worry about it too. As Bluehost is also compatible with most of the popular web applications available till this day. Yes, you can use any of your favorite CMSs with Bluehost shared hosting. You can use auto installer software which will be pre-loaded on your cPanel to install any popular CMS on your website with just a few clicks. Even any beginner user can install a CMS of their choice without having any difficulties. And, if you’re a skilled webmaster and want to install any non-popular web applications or scripts on your site, you can do that as well. For that, you can use FTP. And luckily, they offer free unlimited FTP accounts for any shared hosting account holder. Another great feature of Bluehost is that they have auto updater already installed on all their shared hosting accounts. So, the moment a new update of your currently installed CMS is released it will be automatically updated to the latest version. Indeed it is a time saver. So, you can be sure that Bluehost supports the majority of the web applications. And, the platform is well optimized for all kinds of CMSs. Bluehost offers some remunerative services with their shared hosting packages. We will take a glance at some of the remarkable ones. SSD (Solid State Drive) has taken the place of HDD (Hard Disk Drive) a long time ago. But, most of the web hosting providers still use HDD on their servers to store the data of their customers. However, Bluehost is an exception here. 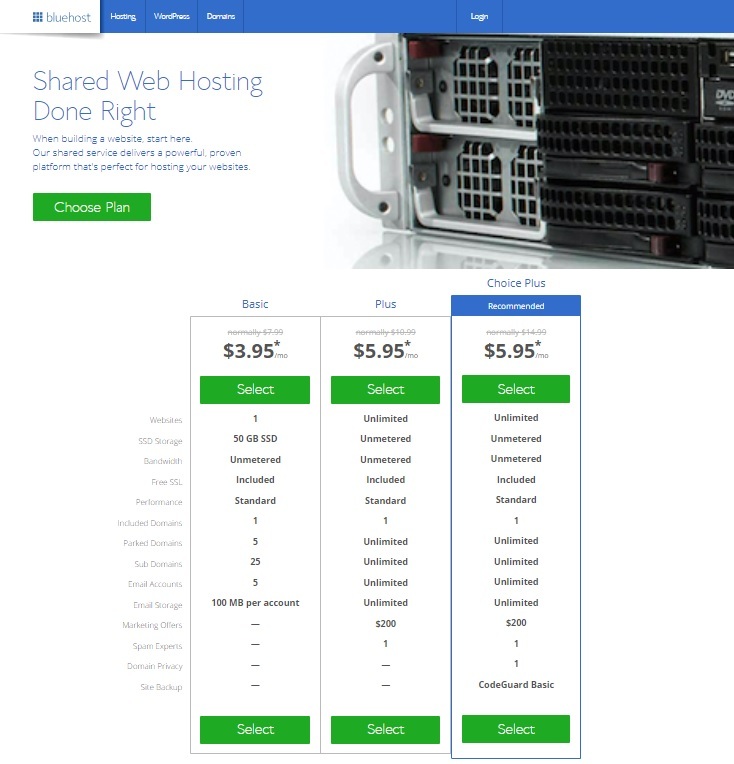 They are offering SSD for a long time with all of their shared hosting plans. It is very beneficial for your website speed. For instance, if your hosting provider uses SSD over HDD, the loading speed of your website might increase up to 20 times. Do you want to make sure that Google doesn’t flag your site as ‘insecure’ on their Chrome browser? I bet you do. To do that, you would have to use SSL encryption on your website. But, it costs additional money. To tackle this problem, Bluehost offers free SSL certificate with each of your domains hosted on Bluehost. Bluehost is one of the rarest web hosting companies who is allowing a free domain name registration. You will get the domain for free for 1 year. After that, you have to renew your domain regularly. Nevertheless, it is a very unique service from Bluehost. You can start small and later expand your horizon using Bluehost. Bluehost allows you to upgrade your hosting package at any moment with just a few clicks. So, if your current hosting service can’t keep up with the load of visitors you are safe as you can upgrade your account instantly. If any of the websites of your shared server uses excessive resources then Bluehost temporarily switch them to isolated systems. Thus, it can’t hamper the performance of other users from that particular server. If you are not content with Bluehost’s service, you can get a full refund within the first month. However, it is only applicable for hosting service. If you have bought a domain name from them, they will not refund that and the domain will be yours for 1 year. Bluehost creates an auto backup of your websites on each day/week/month. So if your website gets compromised, you can restore everything with just a few clicks of your mouse. This is a free feature as well. You have to use your cPanel to perform all the advanced web hosting related tasks. 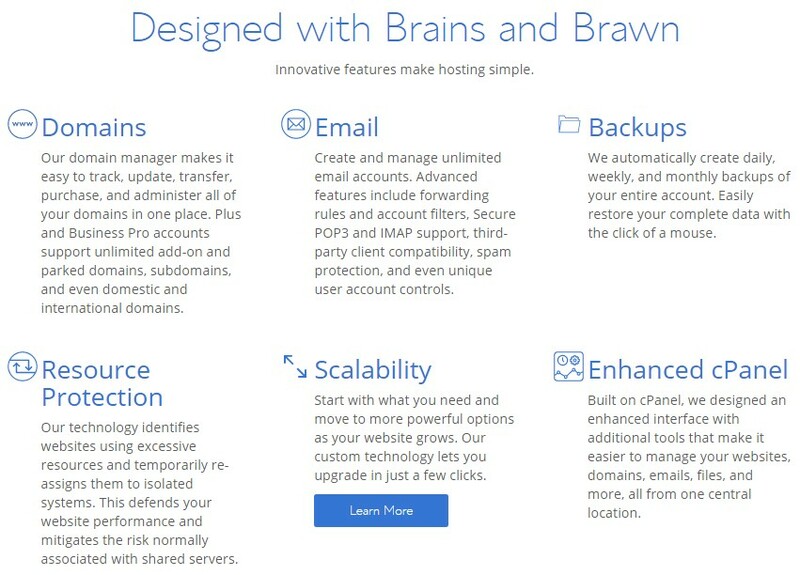 Bluehost has re-designed the cPanel and added several useful tools for free with each. So, any users can use it without any difficulties. Every shared hosting account comes with pre-linked Cloudflare CDN. It is a popular CDN service provider and it is completely free. A CDN can increase the speed of your website/s internationally. You will have the SSH Access to your server. Also, you can schedule repetitive task with the help of the Cron Job scheduler tool right from your cPanel. Except for the ‘Basic’ package, you will be getting the unlimited hosting facility on every other shared hosting packages. Thus, you can add unlimited domains, email accounts (custom), FTP accounts, subdomains, parked domains etc. using your hosting account. There are more of these awesome features and services, we can’t share them all as it will take a lot of time. You can check them out on the official website of Bluehost. Bluehost has a reputation among the webmasters for being a fast web hosting company. For the sake of this post, we want to make sure that if it’s true or not. So, we will be doing an experiment regarding Bluehost’s website speed. Using the famous Pingdom website’s speed test tool, we will be analyzing the load time of a website which is hosted on Bluehost. As you know that Pingdom has numerous test servers throughout the globe, we will be using the San Francisco server for this test. The result denotes that the load time of our website was only 824 ms. This means that our test website was able to load completely within a mere 1 second. In truth, it is one of the fastest performance we have seen for a website. And, you should know that a 2 second load time is even considered as a good one. Whereas, our test website hosted on Bluehost performed far better than that. We didn’t think that the shared hosting of Bluehost would have those great quality servers. This fast load time was only possible because of some high quality and highly optimized servers. We have to admit that, Bluehost actually surprised us in a positive way here. Every website owner wants his/her website to be up and running all the time. Because if your site goes down even for the slightest of time, you can lose many of your visitors. Normally, if a website goes down then most probably the web hosting company is the culprit here. If a web hosting company is not equipped with multiple power sources or if they lack enough power backup then their data center might get down. Along with that, your website will also be down. 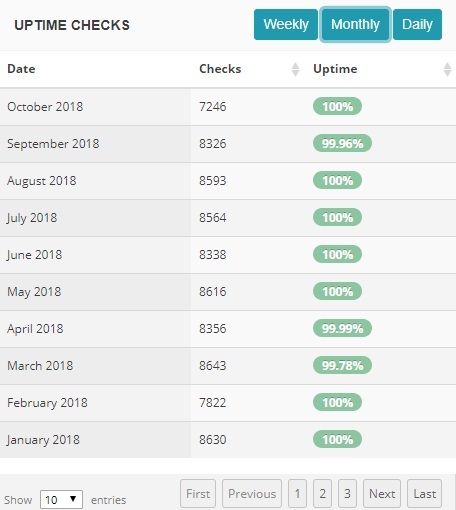 So, it is better to know about your next web hosting company’s uptime performance prior to getting an account with them. But there’s another small yet critical problem. Let’s say that you set your mind to investigate your web hosting company’s uptime record. Hence, you did the same thing what others usually do. I am talking about visiting their website to know about their uptime performance. It’s the easiest way to know about that. But, don’t you think that those self-made claims by those web hosting companies are blatant lies. It is sad but true, most of the companies try this sneaky trick on people to take advantage of them. We know that very well. So in order to let you know the real uptime of Bluehost we tried a very different scheme. What we did is that we have bought a hosting account from Bluehost and hosted a site. Furthermore, we have started to keep track of our website’s uptime status all the time. For you, we will now reveal the uptime status of our website hosted on Bluehost. Below, you will find the uptime status of the last 10 months of Bluehost. You can see it for yourself that Bluehost has been doing great. Webmasters agree that the uptime record of a good web hosting company would be around or above 99%. And, luckily if you look at the screenshot above it is clear that the average uptime of Bluehost is above 99%. Another amazing feat is that Bluehost also kept full 100% uptime for most of the months. Astounding performance! 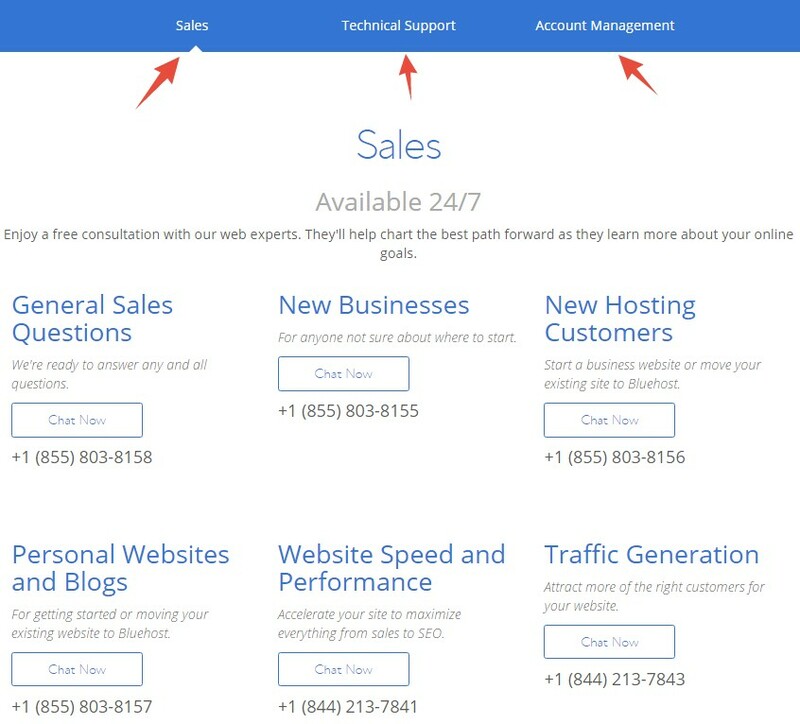 If a web hosting company offers the lowest price but doesn’t have a helpful customer service team, nobody will buy from them. We wholeheartedly believe that every web hosting company should give their customers the highest priority. So, before writing this article we have contacted Bluehost support team on a few occasions. That is why we are going to share our personal experience communicating with Bluehost with you. To be honest, Bluehost was very helpful to us. We asked them about a few web hosting related questions. They answered the questions with great insights. Then we have mentioned some issues regarding web hosting management. Eventually, they got back to us with the perfect solution. The best part is that they didn’t take long to figure out the solution. Actually, they are professional and have been solving such problems for their entire career. Thus their prompt response wasn’t a surprise to us. After all, we were very satisfied with the quality of the Bluehost customer support team. We cannot recommend them enough to you. If you don’t have an account with them, in spite of that you can contact them. So, if you have any queries we would suggest you to communicate directly with them. And you will see it for yourself that how good their team is. If you’re not comfortable talking to a customer representative, you can get help from their support page. They have numerous technical articles including how to, tips and tricks, comprehensive guide on their support page. You can find the exact solution to your problem with ease as these articles are curated categorically. They also have a dedicated FAQ section which is full of common issues regarding web hosting, domains, websites etc. You can also use those resources to your advantage. Frankly, our experience with the Bluehost customer service team was very positive. They were friendly and very helpful. 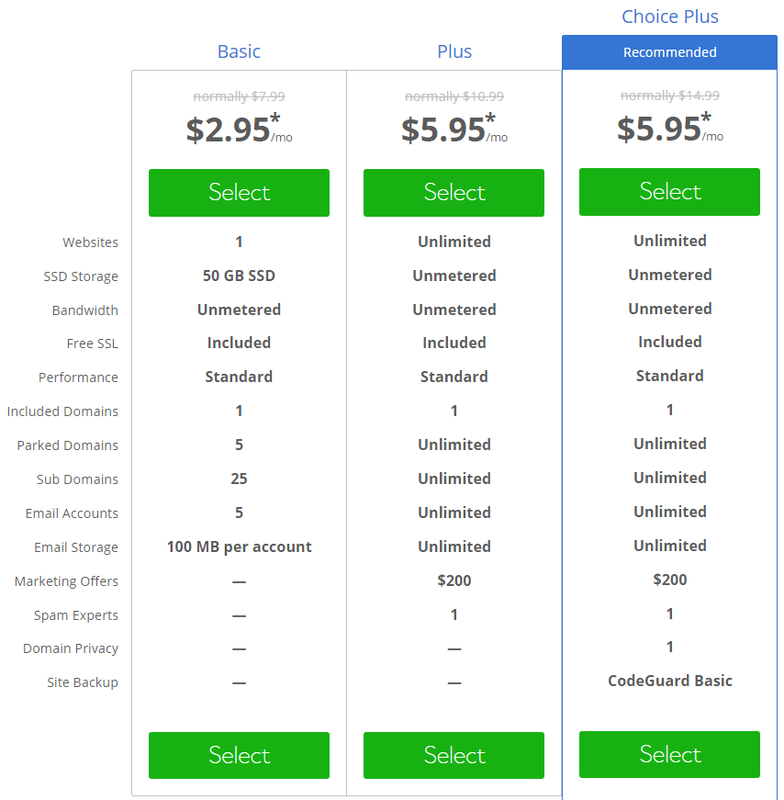 To sum it up: Is Bluehost Shared Web Hosting worth it? The best thing about them is that they offer an affordable price. On top of these, every package comes with some essential features. If you compare their price and the features you are getting then you have to admit that you are actually winning here. Additionally, if you want more customization and versatility, there are additionally paid add-ons available. You can take advantage of those too. Apart from the features and services, you can see that they have the best performance too. We have put them to a real test and found out that their servers are super-responsive even though they are shared. We have also talked about the ever helpful customer service team of Bluehost. They are full of energy, skilled, positive and most importantly care about the mass customers. In addition to all that, you are also getting a domain name for free for 1 year from Bluehost. It is impossible to get an equivalent lucrative deal from any other popular web hosting companies. So, if you were looking for a web hosting service with all the great qualities like fast servers, outstanding security, top-notch uptime, reasonable price, and supportive customer support, then Bluehost shared hosting can be the best choice for you. If you were looking for a web hosting service with all the great qualities like fast servers, outstanding security, top-notch uptime, reasonable price, and supportive customer support, then Bluehost shared hosting can be the best choice for you.